High quality rabbits in assorted natural colors. Medium to heavy fur. 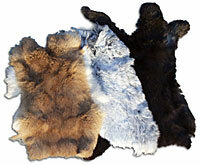 Colors range from black, brown, grey, tan, and other variations. If you need a specific color, just mention your preferences in the "special instructions" section of the order form when you complete your order. Please note that not all colors are always available so let us substitute or just pick them for you.